Durbar Square in Bhaktapur, an ancient city in Nepal. Since the earthquake of April 2015 this charming historic city has been turned into a large construction site. I am in Nepal for a few weeks working with Gavin Gough, who is leading one of his excellent photo workshops. I came to Kathmandu early so I could work on some personal projects. The first thing I did was go back to the same places I went to for my reportage on the immediate effects of the 2015 earthquake. In Bungamati, a woman digs out a walkway between two homes badly damaged in the earthquake. I would like to say that Nepal (and I've just been in the Kathmandu area, the first to get reconstruction aid) is rebuilt and everything is great. I would like to say that people are no longer living in tents, two years after the trembler. I can't say either of those things. Women work on rebuilding a temple in Bungamati. Two years ago, this collapsed temple was an IDP camp. The people who lost their homes in the earthquake have been pushed beyond the city center but are still living in temporary shelters. In some parts of the Kathmandu valley it looks like reconstruction has barely started. Workers (mostly women incidentally) are still digging out homes and buildings with hand tools. 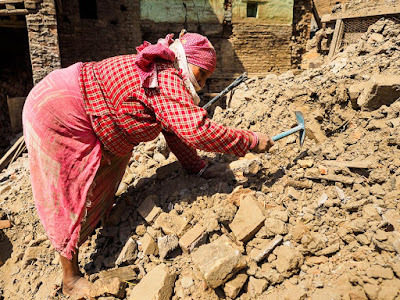 This is not a sign of search and recovery, this is because this is how reconstruction is done in Nepal. It is manual labor. From hauling bricks in for reconstruction to hauling debris out, it's all done by hand. 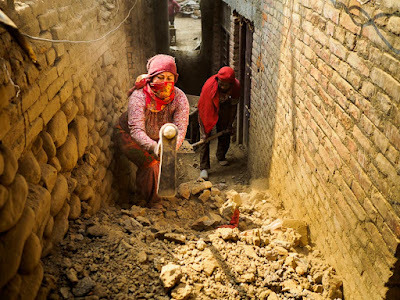 Even the brick factories rely on manual labor from start to finish, a coming story on the blog. In Bhaktapur, a woman excavates a collapsed home with a garden trowel. This two years after the earthquake. 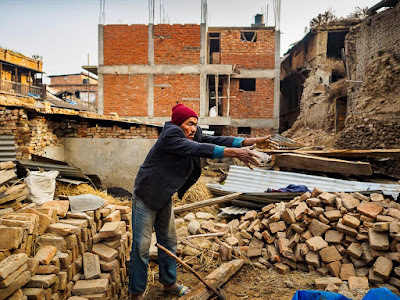 In most of the areas devastated by the earthquake people still scavenge for usable building supplies, bricks and timbers from collapsed buildings are used in the reconstruction. Timber not worthy of reconstruction is used as firewood, bricks not worthy of reconstruction are crushed and remade. In Khokana, a man puts aside wood from a destroyed building that he will later use or sell as firewoord. A building being rebuilt is in the background. Temporary shelters (behind him) are built out of damaged bricks. They are simply stacked up and not mortared together. 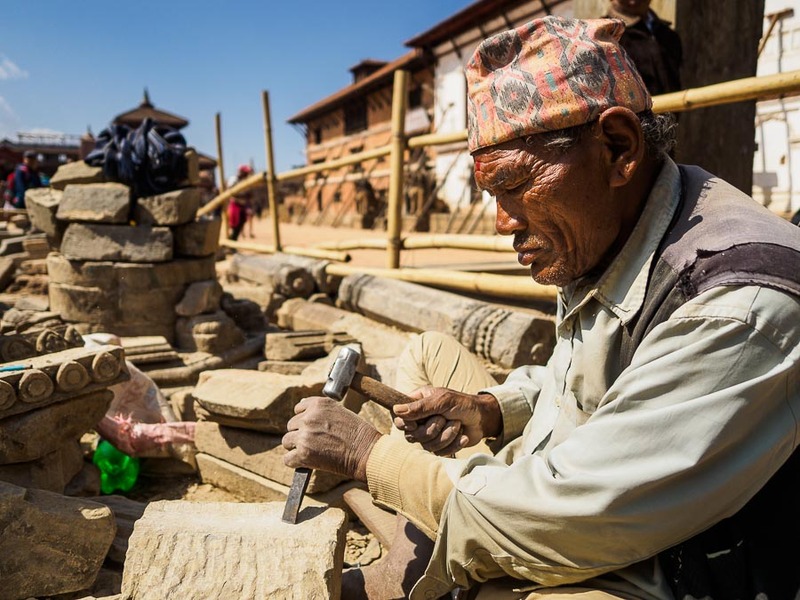 Millions of dollars flowed into Nepal for the rebuilding and it's a question as to where it's all gone. One of the most high profile and successful reconstruction projects, the majestic Boudhanath Stupa, an ancient Buddhist site, was rebuilt privately, with donations from international Buddhist organizations. 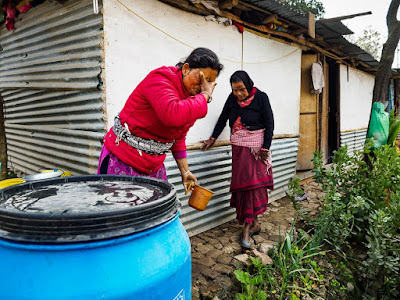 Money is being spent to rebuild the tourist areas, the Durbar Squares in Kathmandu, Bhaktapur and Patan, but it doesn't seem as though much is going into other areas, and many of the people displaced by the earthquake, even in Kathmandu, are still living in temporary shelters. In many cases tents. 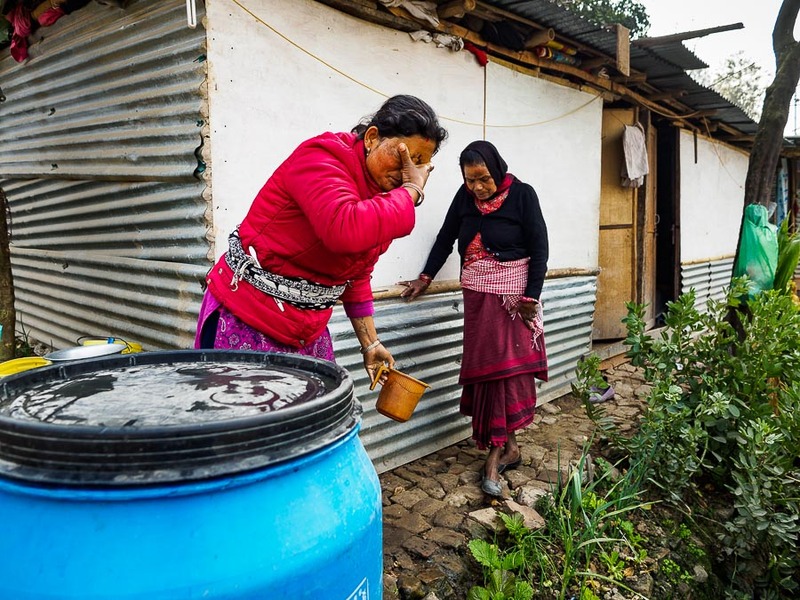 A woman washes her face with water stored in a plastic drum in front of her temporary shelter in Khokana. She's lived in the "temporary" shelter for almost two years. In Bhaktapur's Durbar Square, a craftsman carves stone to go into a temple being rebuilt. 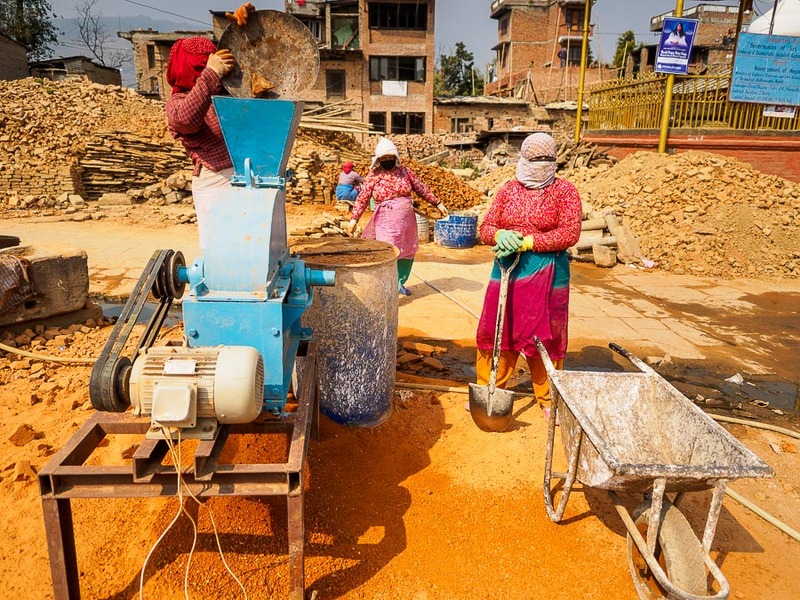 I think the reconstruction of Nepal is going to take decades, if it ever is truly finished. In two years time, it seems as though the surface has barely been scratched in what has become an ongoing crisis. In fact, the situation is now so normalized, I'm not sure it should even be called a crisis anymore. Despite all of this, Nepal is still a great place to visit. The people are gracious and welcoming, the vistas magnificent and the history overwhelming. Kathmandu was a crossroads of Asia 600 years before New York was founded. 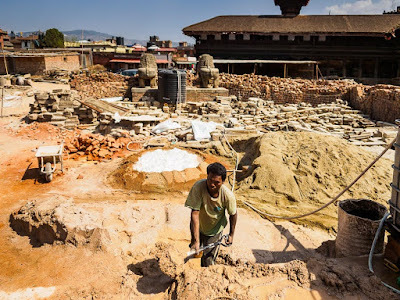 Some of the temples destroyed in the earthquake go back a millennia or more. If you're planning to visit Nepal, don't let the earthquake cancel your plans. Nepal needs the visitors (and their cash) now more than ever. Just know that things will never be the way they were. 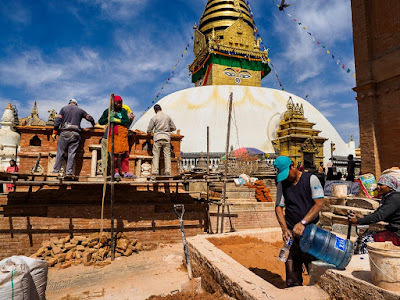 Reconstruction workers at Swayambhu Stupa, a place holy to both Buddhists and Hindus. There are many, many more photos from my reportage on the aftermath of the earthquake in my archive and ZUMA Press is presenting some of them in a zReportage feature.